A source told E! News at the time that the guys grabbed food at Dunn's Famous, a restaurant in the downtown area. Late last year, the 45-year-old revealed that he was letting his leading lady take the wheel with regards to sorting out the wedding details. 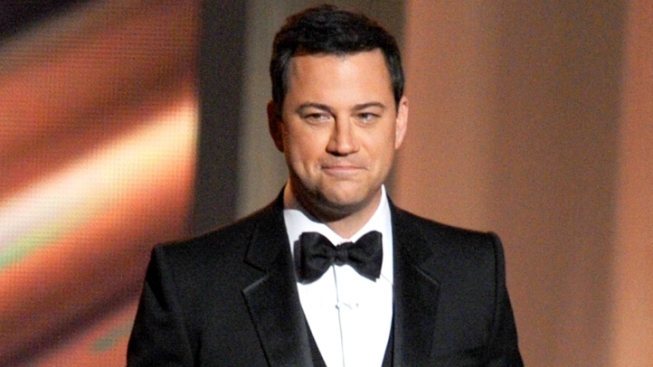 Jimmy Kimmel tied the knot with longtime fianc Molly McNearney today in a ceremony in Ojai, Calif., People reports. The nuptials come just a month after Kimmel hosted his bachelor party in Vancouver with about a dozen of his closest pals, including comedian Jeff Ross. NEWS: Johnny Depp smooches Jimmy Kimmel--check it out! "They were all having a great time and in a good mood. They requested to sit upstairs in a private area," added the source. "There wasn't much drinking but there was some laughing going on. They were just having a good time." From there, the guys went on a two-hour bike ride throughout the city, stopping to take photos of the beautiful scenery and pose with the man of the hour. "I'm not that involved with the wedding planning, but I will be there," he told Us Weekly. "It'll be mostly a family affair and there will be a Catholic priest officiating." WATCH: Jimmy starts the fun early and gets a lapdance from Nicole Kidman! The TV funnyman asked McNearney to marry him in August of 2012 when the two vacationed at Kruger National Forest in South Africa. The Jimmy Kimmel Live! host began dating McNearney, one of the show's head writers, in 2009. This marks his second trip down the aisle. Kimmel was previously married to Gina Kimmel from 1988-2003. The former spouses have two children together, a daughter Katie and son Kevin. Immediately following the end of his marriage, Kimmel began dating comedian Sarah Silverman for 7 years but split in 2009. PHOTOS: See these sneaky Hollywood bachelors!